What first attracted me to Dan’s work was his incredible attention to detail. After working with him on numerous projects, however, I’ve come to realize that the sense of integrity he brings to his work is what truly defines him as a craftsman. We were very fortunate to have had the opportunity to work with Dan and Mary Frances. His creativity and sense of humor makes the design process efficient and memorable. Their meticulous attention to detail and professionalism makes the final product Masterful. Fit, finish and perfection! That’s why I highly recommend and choose to work with Dan and Mary Frances. Dan Rodriguez Fine Furniture has mastered the art of building complementary halves into a whole: careful planning with masterful execution; talented artistry with skillful engineering; intuitive insight with systematic programming; attentive service with focused craftsmanship; Mary Frances Ellison and Dan Rodriguez. 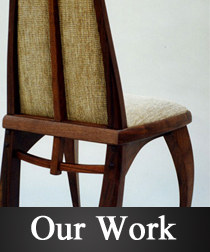 I have rarely worked with craftsmen who offer such a full spectrum of skills and whose end product never disappoints. Dan and I met in architecture school, and in the years since have had the opportunity to work together many times, while maintaining a personal and professional relationship. Dan always brings an artistic design sense to his work as well outstanding craftsmanship that I rely on. I recommend Dan to friends and clients alike with confidence that he will do a terrific job for them, and he always come through. Mark S. HartleyPresident of Hartley Purdy Architecture Inc.